(Nanowerk Spotlight) For several years now, researchers have documented the many intriguing mechanical and electrical properties of carbon nanotubes (CNTs). Some researchers have focused on the optical properties of CNTs. Studying the passive optical response of CNTs they have revealed the manner in which CNTs' optical properties are related to shape and structure of CNTs. It was found that periodic CNT arrays exhibit Bragg diffraction, photonic bandgap properties, and plasmonic resonance; nonperiodic CNT arrays interact with light waves similarly to the way in which radio antennae interact with radio waves. In conventional radio antenna theory an antenna acts as a resonator of the external electromagnetic radiation. Scientists now have demonstrated that a single multiwall carbon nanotube (MWCNT) acts as an optical antenna, whose response is fully consistent with conventional radio antenna theory. "We have the unique capability to fabricate antenna in nanoscale length built over a few years of work on studying aligned carbon nanotubes in my lab since 1997" Dr. Zhifeng Ren tells Nanowerk. "We have been interested in using such antenna for power conversion, light transmission, optical switching, etc." Ren, a professor of physics at Boston College, collaborated with scientists at Natick Soldier Research Development and Engineering Center and Megawave Corporation in his recent work on CNT optical antennae. In previous work, Ren's team had demonstrated that MWCNTs interact with light in the same manner as simple dipole radio antennas; in particular, they show both the polarization and the antenna-length effects. 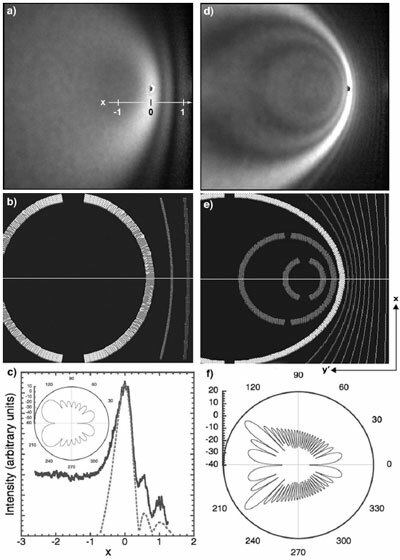 In these previous experiments a random nanotube array was chosen to eliminate the intertube diffraction effects. "Now, our team has demonstrated a CNT antenna-lobe pattern effect at nanoscale length" he says. "This kind of findings has never before been realized due to the unavailability of such antennae." The above figure is the central result of this work. It shows the optical response of a nonperiodic array of CNT light antennae illuminated by a 5mW, 543.5nm, continuous wave laser. It compares directly the calculated radiation patterns (maps), with those obtained from the experiment. For clarity, results for only two distinctly different nanotubes are shown. The top panels (a, d) show the experimental maps: patterns of the scattered light (λ = 543.5 nm) on the screen in the configuration of Figure 3a, for θ = 40°. The left panel (a) is for the sample with nanotubes of median length l = 850 nm, and the right (d) for l=3.5 µm. The middle panels (b, e) in show the calculated maps with each line obtained from the lobe angles for a grounded antenna of corresponding length. The visible antenna effect opens new avenues for light processing in nanomaterials, based on radio technology analogues. For example, one can envision a circuit in which the excited antenna currents can be processed – rectified, amplified, switched on or off, et cetera. "In particular, one might realize the concept of a rectenna, the light analogue of the crystal radio, that is, an antenna attached to an ultrafast diode" says Ren. "This could lead to a new class of light demodulators for optoelectronic circuits, or to a new generation of highly efficient solar cells." One could also envision phased arrays of light antennae, enabling a controlled interference of the emitted radiation. Nanoantennae can also be used as interfaces for various plasmonic devices. In fact, antennae can be fabricated from metals with low plasma frequencies, such as gold or silver, drastically changing their response characteristics. These findings have been reported in the January 29, 2007 online edition of Advanced Materials ("Carbon Nanotubes as Optical Antennae"). Related papers by Ren's team have been published in Applied Physics Letters: "Subwavelength waveguide for visible light" and "Visible light diffraction studies on periodically aligned arrays of carbon nanotubes: Experimental and theoretical comparison".